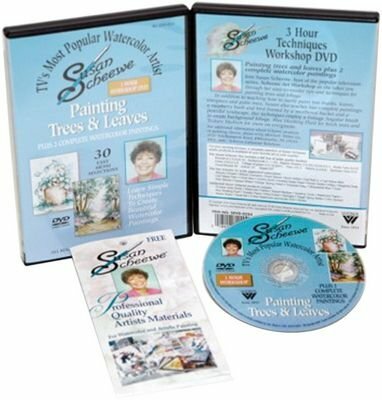 * Join Susan Scheewe, host of the popular television series, Scheewe Art Workshop as she takes you through her easy-to-master tips and techniques for painting trees and foilage. * In addition to teaching how to easily paint tree trunks, leaves, evergreen and palm trees, Susan also teaches two complete paintings: a raspberry bush and bird framed by a weathered bucket and a peaceful landscape. * Her techniques employ a foliage Angular brush to create background foliage, Blue Masking Fluid for birch trees and Texture Medium for snow on evergreens.